A global long-term development, or mega trend, appears to have accelerated through 2018 and the speed currently continues, opening-up new opportunities. During the recent years, I, among many investors, have experienced what I call the “Tesla syndrome”- where the appetite for high tech and so-called innovative companies has been outspoken. The intensive search for new investments is healthy, and it is certainly important to continuously do so. But the risk is that the focus will be on new products, whereas other basic developments are being ignored because investors have fallen in-love with some smart products. 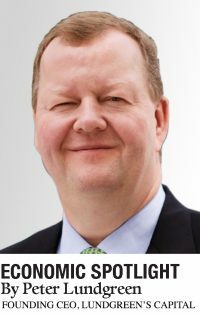 Expectations have been that new technologies and concepts should give global growth another boost – or at least it should have been the case in the United States, which hasn’t transpired yet, so far. Instead, Tesla for example, has only managed to deliver profit for two quarters during the company’s entire lifetime. Investors’ rising expectations are naturally equal to higher stock prices, but 2018 was precisely the year when expectations concerning high tech and innovation were not met. Further, 2019 is not likely to be remembered as the year when these expectations are reached either. 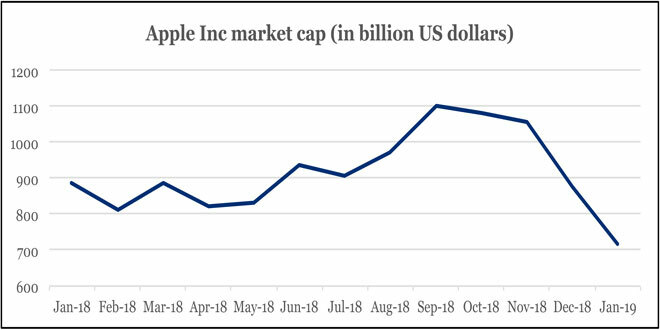 Graphics one shows the development of Apple Inc’s market cap over the past 12 months, and surely, it is not only weaker sales in China that affects the company’s value. Many other companies have experienced the same fluctuation in value, which I simply take as an expression that investors have become more realistic about how quickly new technology can be translated into earnings and dividends to shareholders. Therefore, my expectation is that investors will have a more modest expectation about the returns from these sectors for some time to come. Though in other sectors and geographical areas, opportunities will grow – my feeling is that this partly has been gone unnoticed due to the high-tech focus. 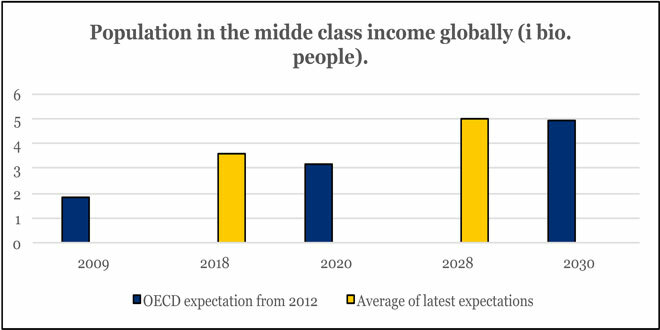 Graphic two shows, among other things, how the OECD back in 2012 expected the population of the global middle-class to develop until 2030. In 2009, 1.8 billion people on the planet belonged to the middle-class, based on income. The OECD then predicted that by 2020, the figure would have grown to 3.2 billion, and 4.9 billion by 2030. But 2018 offered a development that will enhance the strategic investment opportunities reaching far into the coming twenties, i.e. 2020 to 2030. Most analyses indicate that last year, the middle class grew so much that half of the world’s population now belongs to the middle-class measured on income- around 3.6 billion people. In the graphic, it is marked as an average of different analyses, where the same analyses indicate that the middle-class counts 5 billion people in as soon as 2028, and not as previously expected in 2030. When one considers how enormous the trend is, then this development may be considered as quite rapid. Growth in the middle class occurs almost exclusively in Asia, which is remarkable. The development goes on each and every day, and I argue that it is the most important global development well into the twenties waiting ahead of us. No doubt that this growth in the middle-class moves even more purchasing power towards Asia. Many have expected that the trend over time will develop consumer demand towards higher quality products, though this is still not my primary scenario. My main scenario is that the global economy will enter into an infinite “disruptive” development or situation. The reason is that many households that reach the middle-income-class level won’t experience the same increase in their disposal income moving forward (middle income class trap), thus the income level in the low middle-class remains fairly static. The consequence is that a persistent price squeeze on many products and services will remain. The result is that prices are ongoingly adjusted to lower middle-class income purchasing power. I argue that the purchasing power for this reason moves towards the cheapest products on the market, and thus not high-tech and / or innovative products. For the individual company, it will be innovative to develop a “disruptive” product that creates a cheaper solution for a middle-class household. Such a company, therefore, can be very successful, but from a macroeconomic perspective, it seems disruptive. My assessment is that the trend will include many products like durable consumer goods, but there will be a growing demand, thus making the story so interesting. The story just seems rather boring compared to Tesla, Apple, etc., though the trend has long been included in our conviction model. It explains the Roman numeral “II” in the headline, and I still trust that the development opens-up many investment opportunities. After the large drop in the Emerging Markets stock market over the past year, my assessment is that 2019 will offer good opportunities for building position in several “boring” sectors. I fancy innovation and creativity because it is exciting and opens-up opportunities. Of course, investments in innovative companies belong in a portfolio, but as mentioned, it is far from the strongest force in the global economy. By far, the most important force is the need for the cheapest products possible, and therefore, I argue that the ever-ongoing disruptive development of many consumer goods will increase. I can easily imagine that in the future, many more products will be given away to customers free of charge, just for the sake of registering their personal information. The merchants will live off fees, advertising income, or sales of affiliate products. An ever-increasing number of services and sales of products to private individuals will happen across national borders. Therefore, global companies that are already “cost squeezers” can benefit even more from a sustained “disruption” – but most importantly, our imagination about the next year’s global economic development is being tested, and it happens right now….